Loughborough History and Heritage Network | The Loughborough Library Local Studies Volunteers have published a book, From an Artist’s Sketchbook. The drawings of A.T. Warbis a “then-and-now” book compiled by Volunteer Bill Wells. The Loughborough Library Local Studies Volunteers have published a book, From an Artist’s Sketchbook. The drawings of A.T. Warbis a “then-and-now” book compiled by Volunteer Bill Wells. The Loughborough Library Local Studies Volunteers have published a book, From an Artist’s Sketchbook. The drawings of A.T. Warbis as featured in the Loughborough Echo 1950s to 1970s, a “then-and-now” book compiled by Volunteer Bill Wells. The book has been produced following demand during an exhibition in Loughborough Public Library in which the biographical details of Mr. Alfred Thomas Warbis, a selection of his original drawings and objects associated with his life were on display. 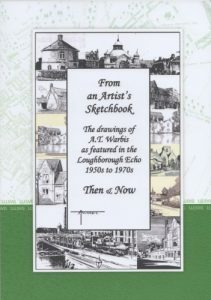 The resulting book contains 52 of his beautiful line drawings of buildings and scenes in Loughborough and surrounding villages as published in the Loughborough Echo. Each of his drawings for the Echo was accompanied by a descriptive paragraph – the result of careful research – and these texts accompany each drawing with a modern-day photograph of the same building or scene as it is today. Priced at £7.99 the book is available for sale at Local Studies, Loughborough Library, Granby Street. Proceeds from the sale of the book will go towards funding future Local Studies’ publications. For enquiries, the Local Studies area is staffed by the Volunteers from 10.00am to 12 noon and 2.00pm to 4.00pm, weekdays, excluding Wednesdays. Born in London in 1883, “A.T.”, as he was known, was making his living as an artist by the age of 27. During the 1920s while based in Yeovil, Somerset, he illustrated a number of books on local history and architecture and became Publicity Manager for Petters Ltd., a manufacturer of diesel engines. In 1939, when Petters became part of the Brush Group, he transferred to Loughborough where he married his second wife Mary and initially set up home in Market Street. 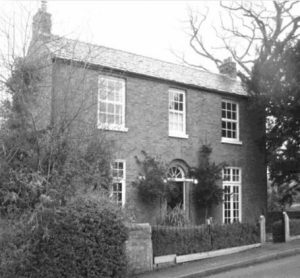 After spending the war years in Shepshed, during which A.T. served in the Home Guard, they eventually moved to Barrow-on-Soar, living first in Cotes Road and then at Mill House. A.T. contributed his column From an Artist’s Sketchbook to the Loughborough Echo until 1974 when his health forced him to give up. 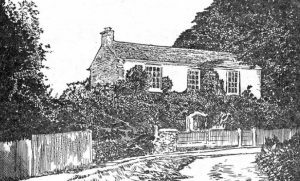 He celebrated his 1,000th sketch for the Echo with a picture of his home, the Mill House. It has been estimated that during his long career A.T. published over 5,000 black and white sketches – at one time having thirty different drawings in 30 different publications. He died in 1976 at the age of 92 and lies in the cemetery on Cotes Road in Barrow. The Loughborough Library Local Studies Volunteers’ book celebrates his legacy – that of a wonderful record of Loughborough and its surrounding villages during the mid-20th century.